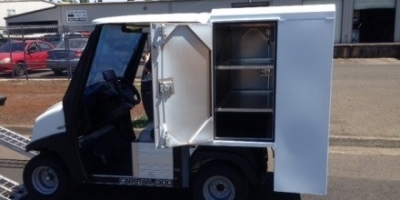 Golf cart cab enclosures are manufactured with aluminum panels which are welded into one a single piece to provide complete enclosure. Our cab enclosures have lever style door handles with bear claw catches and gas shock assisted rear hinge (suicide) entry doors. The cab enclosures are then accented with a 4” venting window at the bottom of windshield, a rear sliding window and sliding windows on driver and passenger doors. Our intricate fabrication allows for easy set-on and bolt-on installation. Available options include windshield wiper kit and rear extension canopy. We also offer powder coat interior and exterior in standard colors at no additional cost. 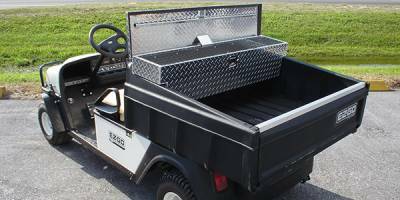 Edmunds Metal Works golf cart van boxes are manufactured with aluminum walls that are welded into a single unit. We also use stainless steel locking latches and hardware. 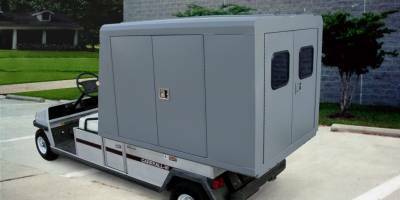 All van box units include powder coating in standard colors at no additional cost. Edmunds Metal Works also offers options for custom shelves, dividers and drawers for all van boxes upon request. Golf cart food service boxes are perfect for bed & breakfast inns, hotels and resorts. Our service boxes are all aluminum panels welded into a single piece. 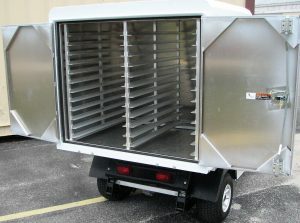 We offer insulated and non-insulated options to keep food at an ideal temperature. In the interior, we provide 1” x 1.5” racks to hold serving trays to customer’s specifications. We finalize our food service box with stainless steel locking latches and hardware. Custom powder coat color is also available in standard colors on most units at no additional cost. Ideal for bed & breakfast inns, hotels and resorts, our housekeeping & room service boxes are equipped with drawers, garment racks, slide out trays, and hot box areas upon request. We custom weld aluminum panels into a single piece unit with stainless steel locking latches and hardware. L-shaped units available for several golf car models. All housekeeping & room service box units include powder coating in standard colors at no additional cost. 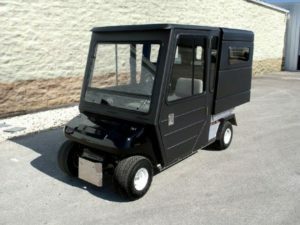 Our boxes are custom designed to fit your golf cart and utility vehicle’s size specifications. We manufacture our tool boxes using aluminum tread brite (diamond plate) and accent them with stainless steel locking latches and hardware. We also use foam rubber seals on lids to ensure total enclosure at lid. Edmunds Metal Works provides mounting hardware for almost every golf car model. These tool boxes are available in standard colors using powder coat at some additional cost.